"Extra sockets added to one room, new consumer unit added and various other things brought up to correct spec. Excellent service, prices and clarity of information. Really easy to understand for 'non electricians' and clearly explained at every step. Would definitely recommend to anyone, and would definitely use again." Contact at least 3 electricians - Find the details for at least 3 electricians listed in your area who carry out the type of electrical work you need carried out. Know what you want - Be clear about the work you want done and, unless the work is minor, obtain at least three written quotations. Use a registered electrician - Check the electrician is approved by a reputable body or registered with a government-approved scheme such as ELECSA, NAPIT or NICEIC. Check them out - Ask for references and follow them up. Also check that the electrician has public liability insurance of at least £2 million. Get a written quotation and agree terms - You can download a template quotation request form from the Electrical Safety Council’s website at http://www.esc.org.uk/find-an-electrician/consumer-guides/ordering-electrical-work.html . Only supplies a mobile no. and gives no address on their letterhead/business card. Will do the job ’cheaper for cash’ on the grounds that the customer avoids paying the VAT. 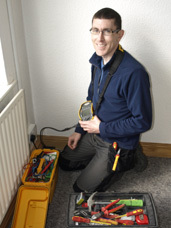 Says they can start tomorrow – a registered electrician is usually booked up well in advance. Will not confirm anything in writing. Tells the customer they are approved by an organisation when they are not. Tells the customer not to worry about the details of the job. Confuses the customer with jargon and complicated explanations. Cannot give a specific cost for materials or labour but asks for money upfront. Provides a quote that is surprisingly low – if something sounds too good to be true, it usually is! 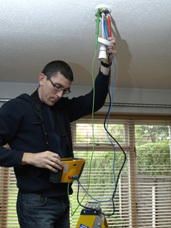 For more advice visit www.esc.org.uk or call the Electrical Safety Council advice line 0870 040 0561.